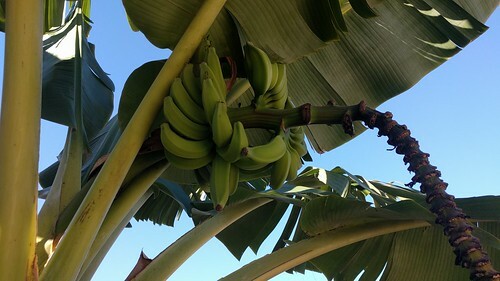 I mentioned these bananas on my initial post. I got both from friend who got it from India. 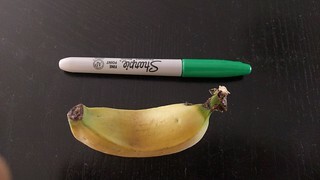 Yep ... they're both BANANAs. 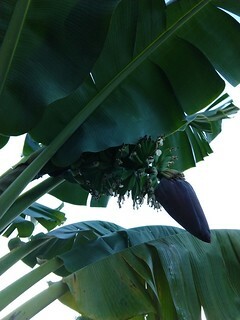 Here is are pictures of the Mystery Banana #1 flowering. Looking at the kerala one you sent it kinda looked Mysore to me and that picture looks Mysore. I hope others chime in. I hope what I sent is doing good for you. 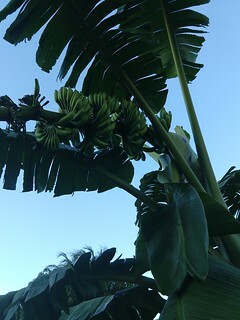 Could it be Rasthali which I understand is a type similar to Brazilian or manzano? The bunch does look kinda horizontal. Thanks for the pics and congrats on the bunch! Here an updated picture to how the bunches are doing. 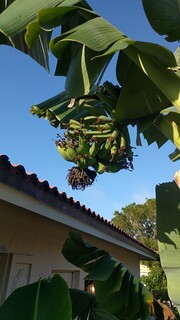 The second tree (of the same variety) put out a bunch as well. 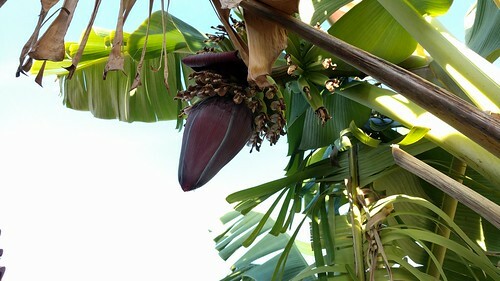 They are a type of Pome banana, similar to common ‘Brazilian’. 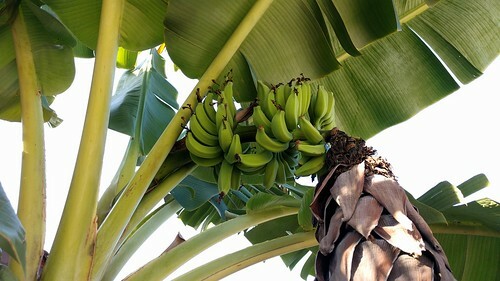 The only other common Pome bananas in the US are ‘Dwarf Brazilian’ and ‘Raja Puri’, but there are many more from India, hard to say exactly which one you may have. 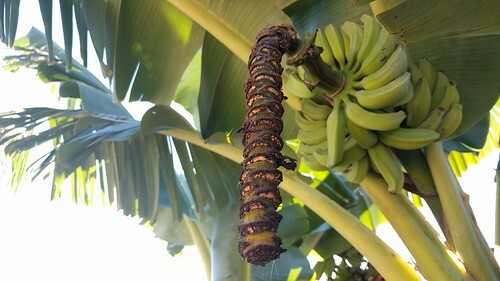 It is not ‘Rasthali’ though as that is a Silk subgroup banana, or 'Mysore'/'Pisang Ceylon' which is a different subgroup as well, whereas yours is Pome subgroup. Do you know where exactly in India it came from? Last edited by Gabe15 : 12-16-2017 at 02:14 PM. I believe both of these came from Kerala. 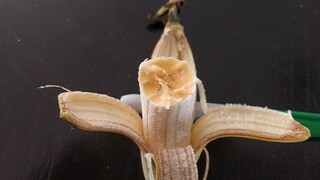 "Banana 1" is a lot more sturdy. 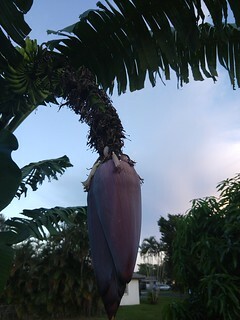 I haven't tasted the fruit yet. "Banana 2" taste (to my untrained pallet) more like a "apple banana" as it has a decent amount of tart to it. 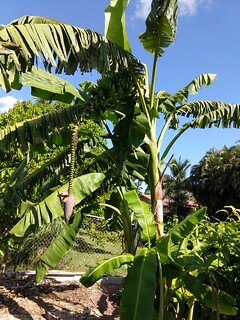 I got rid of the "banana 2" mat after the hurricane mainly due to it not being sturdy. I managed to track down an alive tossed pup and just planted it. 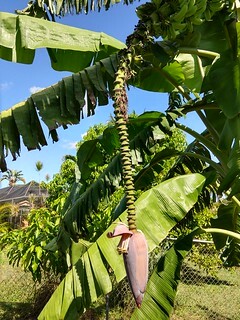 Hopefully some of "banana 1" fruit is ready in January. 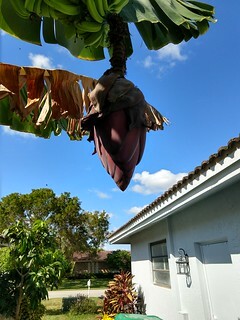 If anyone is the neighborhood and wants a pup or wants to try a fruit your more then welcome. 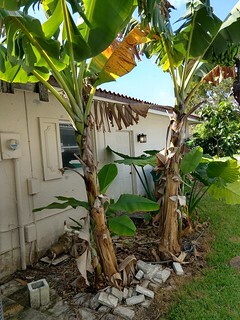 Now with a better id I will plant it next to my Brazilian for a side by side compare. Here a few more pictures from this morning. 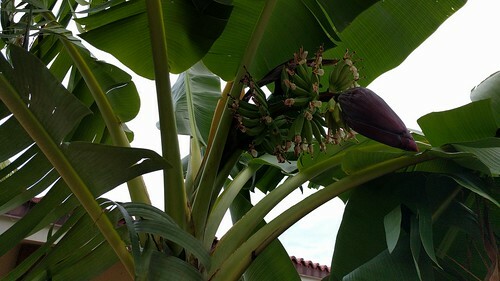 I removed the male bud from both hoping to see how fast I can get the fruit. Is there any other types of picture that would help narrow this down? 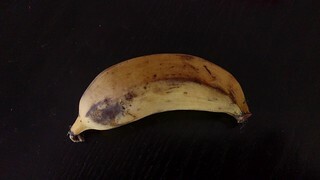 Picked a banana, tried to ripe it inside but it just turned black instead. Looking good! 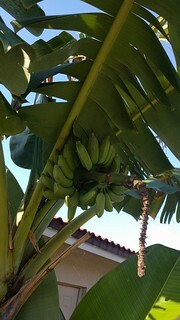 The top bunch is looking very similar to a filled dwarf Brazillian! It will be fun to compare the 2! On the other #2 variety you said the fruit is tart right? 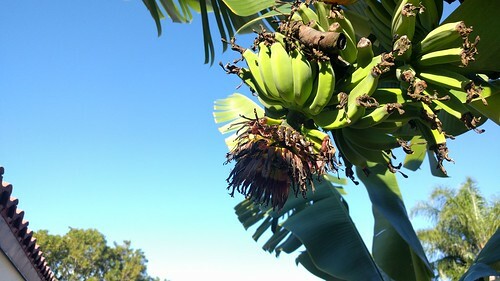 What about when the fruit is over-ripe. Black spots, etc. still a little tart or does it go away! Hope everything is going great for you! 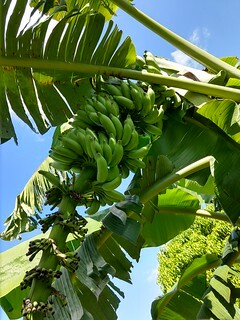 Bunches are looking great! 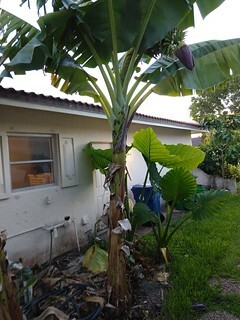 It might be semi-ripe, I like it like this. I'll try to let some get some black spots. 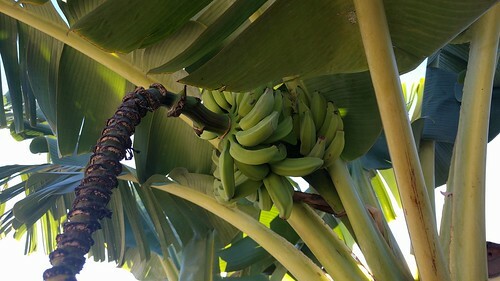 Wow look at the pulp color. For sure not like my Brazilian. They seem fat compared to mine also. Very interesting. All yellow with a few black spots. First off I didn't notice the textural difference i noted before with the "core". The weird thing is that it had sort of a Rose Water (best i can describe) aroma. I haven't tasted many different types of bananas so this was a first. I personally will rather eat it at the yellow/green stage as i don't find rose water appealing. If anyone is the neighborhood this weekend (Coral Springs), you're more than welcome to try one. Somehow I missed the rest of this post. I received a sample of each plant. 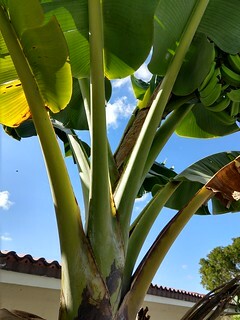 One plant is growing just like my Brazilians and as of right now I can't tell the difference. 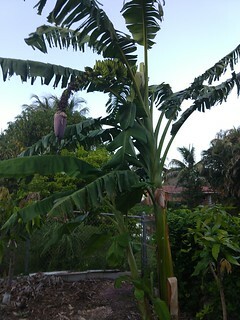 The other banans plant is still small for me but the plant overall looks just like my mysores. 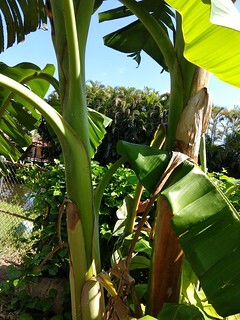 Even has red blush under all the new leaves. The fruit in the picture look different than what I normally get on my mysores. 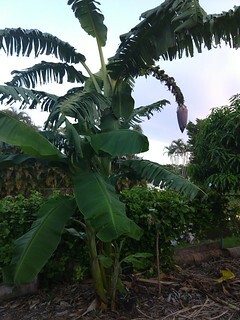 With limited knowledge I think the other plant could be a type of mysore. 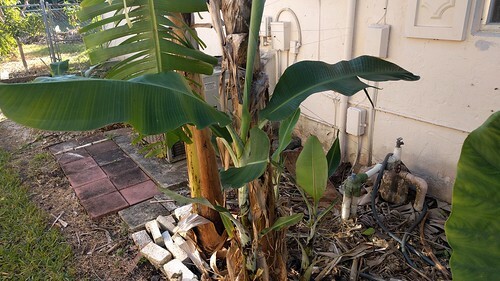 The other banans plant is still small for me but the plant overall looks just like my mysores. Even has red blush under all the new leaves. 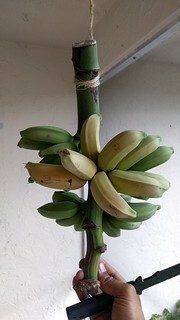 I just received a "Pisang Raja" (pup/well established TC) from 'Eat your Backyard' here in Jax. 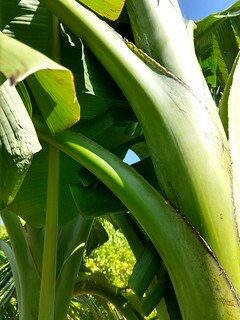 It looks almost as long and slender as my Pisang Ceylon, with a red blush half way up the pseudostem. 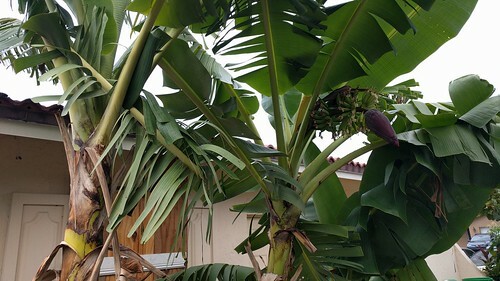 However, my searches have been limited in this cultivar, Instagram posts show that the fruit looks different than what is posted above. 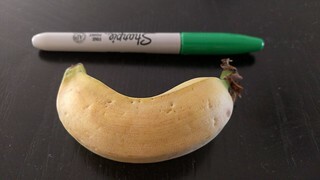 The pulp is a very golden-yellow, and is similar in size to Cavendish. 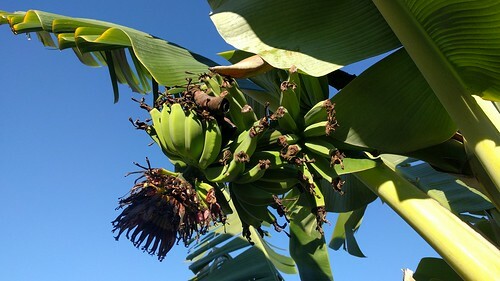 Flavor reports on there are also that it is an extremely sweet cultivar. Sorry about being a month late. 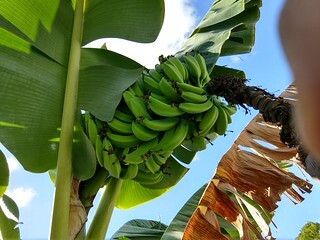 I just got the nanner a week ago, and I have been trying to do a lot of research on it. I hope this input helps. Last edited by zfallon84 : 08-27-2018 at 09:08 PM. 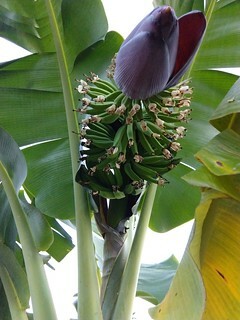 Attached are some updated pictures of the bananas currently fruiting. 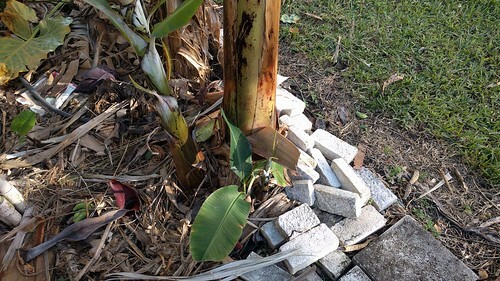 Fertilizer sparingly and watered by rain. 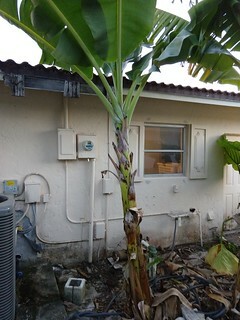 I removed this and had second thoughts so I rescued a pup from the heap and planted it in January. It's in a heavily mulched area with good soil moisture a nutrition. Also wanted to say thanks to everyone who is working on the IDs. If anyone wants some pups from either let me know, I'm probably going to make some room for different varieties soon. Last edited by skhan : 10-01-2018 at 12:03 PM. Heres a few more pictures. I tried leaving everything on to help with IDing (unlike last year).